So I thought everything was going to be back to normal this weekend. 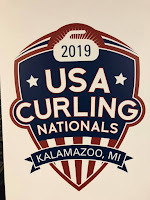 No national championships in the area (though the USATF Indoor Championships are taking place this weekend), no vlogs, and a weekend finally to catch up with all the crazy winter sport championships that have been taking place. And then I happened to come back to visit my parents, placing me near Ann Arbor, where Michigan was hosting the B1G Indoor Track and Field Championships. When the last group of tickets opened up on Tuesday, I took the chance and snatched up a ticket. An hour later, the final tickets had sold for the weekend, so I'm glad I didn't hesitate! 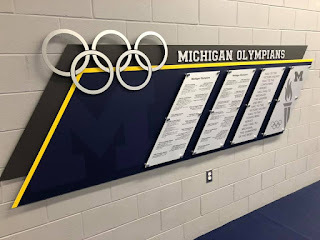 In 2018 the University of Michigan introduced a brand-new track and field (and lacrosse) facility a few miles south of the main campus. There was a new outdoor track with all the necessary field space as well as a new indoor building. And what a building it is! 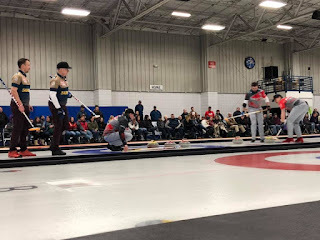 Another exciting week of curling has come and gone, and I had a ball! I really, really enjoyed all the live-streaming of the U.S. Curling National Championships during the week, which kept me in tune with what I was going to see in the finals. The plan for Saturday was pretty perfect: go to Panera Bread and pick up a salad that I could store in the car until eating it in between matches, then go to Sweetwater's in Kalamazoo and pick up some of the best donuts you'll ever eat, watch the women's match, eat salad, watch the men's match, then eat some Chick-fil-a before heading home to relax. Luckily, the execution lived up to the planning! You can't keep me away from National Championships! Just two weeks after enjoying my time in Detroit, I take a little jaunt over to Kalamazoo (about 2ish hours east of Chicago on I-94) to watch Day 1 of the U.S. Curling National Championships. This competition is going to be taking place all week, but I need to make sure I still do, you know, my job, so I'm just attending both Saturday events. I had a lot of fun sitting in the Wings Event Center, and my vlog basically sums it all up! I'm looking forward to seeing more of these men and women this week through USA Curling's live stream now that I've seen them live and in person! With that, let's go to the vlog! Enjoy, and I'll see you next week for the finals! And if you're interested, here are my PyeongChang blurbs from one year ago! Crazy! I'm Claire Nat and you're reading Light The Cauldron! Follow me on Twitter and Facebook @CauldronLight and read my past Olympic articles! 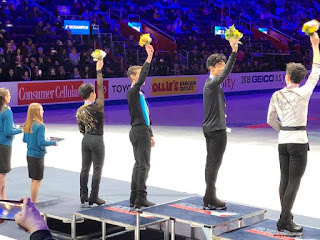 It's been almost a week since I saw the men's free skate, and I'm still not over it. I've never seen quads done in person. I did last weekend. GOOD GOLLY! My parents and I were there for five hours, but it did not feel sluggish at any time. The weather going back to Little Caesars Arena on Sunday afternoon was much different from the weather we had to deal with the night before. As we exited the arena on Saturday night, we were met with a slushy mush of snow, which I certainly wasn't expecting. Thankfully, the flurries were done by noon, the roads were cleared, and we didn't have any problems. I had paid for parking again, and my mom in particular was thankful for the quick walk from the parking structure over to the arena. We arrived just as the doors were opening, and wandered around the main concourse. Boy were we glad we didn't just go to our seats!